A newspaper article from The Baltimore Sun published on May 20, 1963. Written by Stephen A. Bennett, the article provides details Mercury-Atlas 9 (MA-9), the final manned space mission for Project Mercury. MA-9 launched from Launch Complex 14 at Cape Canaveral Air Force Station (CCAFS) in Cape Canaveral, on May 15, 1963. Gordon Cooper (1927-2004) traveled in Faith 7, successfully orbiting the Earth 22 and a half times before returned to Earth the following day. 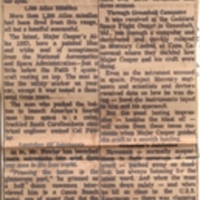 Original newspaper article: Bennett, Stephen A. "Canaveral Leaves Mind Sharp Bits Amid Clutter." The Baltimore Sun, May 20, 1963: Private Collection of Dr. Calvin D. Fowler. Digital reproduction of original newspaper article: Bennett, Stephen A. "Canaveral Leaves Mind Sharp Bits Amid Clutter." The Baltimore Sun, May 20, 1963. The Baltimore Sun, May 20, 1963. Originally created by Stephen A. Bennett and published by The Baltimore Sun. Copyright to this resource is held by The Baltimore Sun and is provided here by RICHES of Central Florida for educational purposes only. Bennett, Stephen A.. “Canaveral Leaves Mind Sharp Bits Amid Clutter.” RICHES of Central Florida accessed April 24, 2019, https://richesmi.cah.ucf.edu/omeka/items/show/6416.